Gird your loins, America. 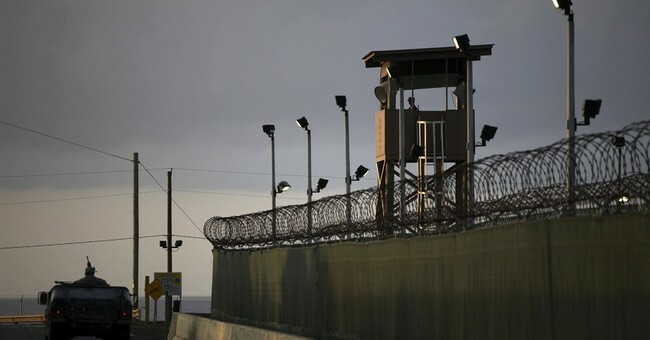 President Obama intends to empty out Guantanamo Bay and send scores of suspected Muslim terror operatives back to their jihadist-coddling native countries. Goaded by anti-war activists and soft-on-terror attorneys (including those from Attorney General Eric Holder's former private law firm), Obama announced Thursday that he'll lift a ban on sending up to 90 Yemeni detainees home and will initiate other stalled transfers out of the compound. This radical appeasement of Obama's left flank is a surefire recipe for more Benghazis, more U.S.S. Coles and more innocent lives at risk. Abdulmutallab reportedly told the FBI there were countless al-Qaida trainees like him in Yemen. The CIA knew of Abdulmutallab four months before his bombing attempt and was aware of him meeting with terrorists in Yemen a month before his arrest. British media also reported that counterterrorism and intelligence officers were "aware of several British nationals and British residents who had trained at camps in Yemen's 'ungoverned spaces.'" From the very first days of Obama's presidency, Americans in Yemen have been endangered. In late January 2009, the U.S. Embassy in Yemen came under gunfire. American diplomatic staff had been warned of a pending attack. That same month, two former Yemeni Gitmo detainees, Said Ali al-Shihri and Abu Hareth Muhammad al-Awfi, released a video flipping America the bird. They publicly recommitted to "aid the religion," "establish the rightly guided caliphate" and "fight against our enemies" after undergoing terrorism "rehab" in Saudi Arabia. Charlie Sheen's rehab worked better than that of the Sauds. Military review panels indicated that al-Shihri had traveled to Afghanistan two weeks after the 9/11 attacks, trained and funded jihadists outside Kabul, and coordinated travel for al-Qaida before being captured and held at Gitmo. After his release by the Bush administration, intel officials say he was involved in the deadly bombing of the U.S. Embassy in Yemen's capital, Sana'a, in September 2008. Yemen also produced Jamal Ahmed Mohammad al-Badawi, the convicted mastermind of the U.S.S. Cole bombing that took the lives of 17 American sailors in October 2000. As I've reported previously on the Yemen jihad revolving door: Despite being sentenced to the death penalty, escaping twice from jail and being indicted in the U.S. on terrorism charges, the Yemeni government freed al-Badawi in 2007 in exchange for a promise that he renounce his old murdering ways. As he did with the families of the Benghazi victims, Obama had promised the families of the U.S.S. Cole bombing victims "swift justice." Instead, the administration initially dropped the death penalty case against a key Cole plotter being held at Gitmo -- former Persian Gulf Operations Chief for al-Qaida Abd al-Rahim al-Nashiri, a Saudi Arabian national of Yemeni descent -- and has dragged its feet on reinstating and pursuing the trial for four long years. Which side are Obama and his lawyers on, anyway? As I reported in "Culture of Corruption," Covington and Burling, the former private law firm of Close Gitmo crusader and Attorney General Eric Holder, has provided dozens of Yemeni Gitmo detainees hundreds of hours of pro bono legal representation and sob-story media relations campaigns. While these bleeding-heart lawyers dismiss the perils of Gitmo recidivism, the numbers don't lie. I repeat: The office of the Director of National Intelligence reports that 27.9 percent of the 599 former detainees released from Guantanamo were either confirmed or suspected of later engaging in jihadist attacks. __One of those Gitmo recidivists still on the loose is Ansar al-Sharia leader Sufyan Ben Qumu a.k.a. Abu Sufian bin Qumu, the suspected plotter of the 9/11/12 Benghazi attack.